Thousands of Haitians are spending a second night in the open after the country's catastrophic earthquake which may have killed tens of thousands. Medical aid agency Medecins sans Frontieres reported a "massive influx" of casualties at its makeshift clinics, many of them with severe injuries. The search for survivors under the rubble went on after darkness. Substantial foreign aid for the three million people said to be in need is due to begin arriving within hours. 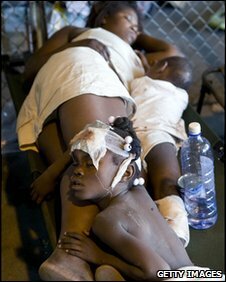 Twenty-four hours after the earthquake, and we flew into Port-au-Prince. Just along the tarmac we found some aid trickling in. The airport buildings here have been damaged but not, it seems, the runway. Many of those who can, are leaving. Millions, though, are left behind in a country that can barely function, even without a disaster. Many of the UN peacekeepers stationed here are among the dead. This country - so often forgotten by the world - now needs its help more than ever. The first US aid planes have already landed at the airport serving the capital, Port-au-Prince, and US naval ships are on the way. EU states, Russia and China are among those sending rescue and medical teams by plane while pledges of aid have been made by countries around Latin America. UN peacekeepers, who played a key role in maintaining public order in Haiti even before the quake, have been deployed to control any outbreaks of unrest as reports come in of looting. The BBC's Andy Gallacher in Port-au-Prince says the situation in the capital is increasingly desperate with no sense of a coordinated rescue effort, scant medical supplies and aid only trickling in. Haitian President Rene Preval could not give an official estimate of the dead, saying: "I don't know... up to now, I heard 50,000... 30,000." He spoke of how he stepped over dead bodies and heard cries of those trapped in the parliament building. The 7.0-magnitude quake, Haiti's worst in two centuries, struck at 1653 local time (2153 GMT) on Tuesday, just 15km (10 miles) south-west of Port-au-Prince and close to the surface. Thousands of Haitians gathered in open spaces overnight in the capital on Wednesday, too scared to sleep inside damaged buildings. Many sang hymns to keep up their spirits. The BBC's Matthew Price visited the grounds of one hospital and spoke of seeing about 100 bodies - but there were many people bedding down for the night to sleep among the dead. Efforts to rescue survivors trapped in rubble have been hampered by the lack of heavy lifting equipment and much of the work is being done by individuals with simple tools or their hands. One Chilean UN peacekeeper told Reuters: "We just don't know what to do. You can see how terrible the damage is. We have not been able to get into all the areas." Haiti is the poorest country in the western hemisphere and our correspondent says it simply does not have the infrastructure to manage a rescue operation. He says that there have also been a number of aftershocks and people are very frightened - a number of Haitians were panicked overnight by a false rumour that a tsunami was approaching the island. Patients with "severe traumas, head wounds, crushed limbs" have been streaming into MSF's temporary structures but the agency is only able to offer them basic medical care, spokesman Paul McPhun told reporters in Toronto. One of MSF's emergency medical facilities collapsed during the quake while the other two were so badly damaged they became unusable, he said. At least 1,000 people have sought help at three temporary MSF sites, including some 50 people who were treated for burns caused by domestic gas containers exploding in collapsing buildings. With many of Haiti's communication lines down, Haitians living abroad have been battling to get through to relatives. In the main Haitian community in the US, Miami's Little Haiti, people have been meeting to pray and to raise money for relief efforts.